Malwarebytes (2nd recommended step to help find computer problem. Thread: Malwarebytes (2nd recommended step to help find computer problem. 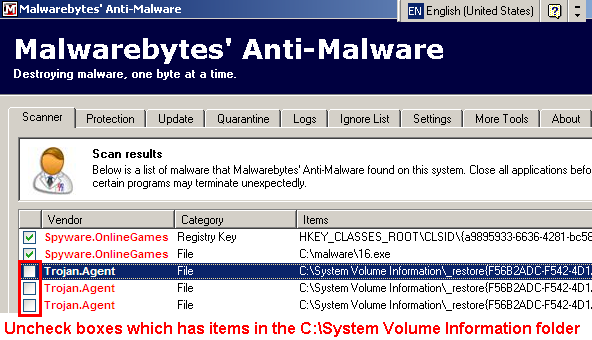 have a question...I am trying to run Malwarebytes (the 2nd step you recommend doing to prepare to submit the logs.) Is Malwarebytes a free scan? I am confused when I go the website. Pleasure to meet you! I'm sorry you had to wait so long for a reply. Is that other post concerning the same computer that you are trying to run Malwarebytes on now? If so, it might be best if we have one of the guys open that thread back up for you. It is best to keep all the information concerning the same computer in one thread. They can even move these posts to that thread. Let me know if they are the same computer or not. Ok! Yes. Malwarebytes is a free scan. There is also a version that you pay a one time fee for. Let me give you a better set of instructions to follow that has a different link for you to click on. I hope this helps. If not, please do stop and ask any questions you'd like. I'll do my best to answer them for you. Click on the words above. Next look for and click on the Download Now button with the arrow to the left that is pointing down. In the little box that pops up, click on the words Save file and save it to your desktop so you can find it. Please post contents of that file in your next reply. How to copy and paste the contents from notepad into a reply box. Left Click "anywhere" within the notepad box then Right click and choose Select All from the list of options and all the text within the notepad box should turn blue. Now Right again and choose Copy. Next, come to your thread here at Help2Go and left click in the Quick reply box at the bottom of the page. Right click and choose Paste from the list of options. Remember, if you have any questions at all, please do not hesitate to ask. Last edited by DonnaB; 09-28-2012 at 06:45 AM. Not sure why you had trouble posting last might. It could have been many things that caused that. The important thing is you were able to post this time. Ok. So it is the same computer. Let's not worry about the threads at the moment. The important thing is to get Malwarebytes installed and see the log it produces. Let me know if you need help or have questions with anything you do not understand. Thanks for the message.....I am having problems getting anything to work right with my computer. When I log on, it takes forever for the home page to come up. Everything I try to do it seems to crash. Then I have to shut the computer down and start all over again. I is actually driving me a bit "bonkers" I must have some king of "bug" anyway I did as you said in your instructions....clicked on mawareware bytes and then did not see any drop down box to choose the desktop. Not sure what I am doing wrong but when I first posted I was in the process of going through the steps and had downloaded malwarebytes to I believe the D drive.....not the desktop. I think that it has expired not (malwarebytes) Not sure if I can download it again....I wish SI were more computer savvy.....but maybe I will get there....if I don't just give up! Maybe I can get to the bottom of it....just keep telling myself to patient.....Yikes!!! In my dreams I am wishing I can become a "Geek""! In the first post of your other thread you mentioned "Safe Mode". Will the computer boot to "Safe Mode"? If so, please try that, but once you get to the Advanced Boot Options screen choose "Safe Mode with Networking" instead of just "Safe Mode". Do you have a USB FlashDrive and another computer in the house just in case files need to be transferred? I'll be here off and on all night if you need questions answered or further guidance. Keep me informed to your progress. I just wrote you a note and it said that I didn't have permission to refresh and log on again....so I did....hope it works this time. I did dwhat you said (pressed F8 to get into safe mode and then went to the "safe mode with networking" I am not familiar with safe mode or safe mode with networking...but I am learning....thanks to you!! Is you time zone different than mine? I tis now 5:22PM. You must be on the West Coast. I am in Illinois. 2 hrs ahead of you. No work tomorrow so I'll be up late. Great! I do that also. Do you have a USB Flash Drive? We may need one to transfer files from the laptop to the desktop. It's not hard to do once you do it the first time. How long did the scan run? Do you know if the scan finished on it's own or did the computer shut down while it was still scanning? Did it get to the point where it looked similar to the picture above with the check marks to the left of the entries and you were able to click on Remove Selected? It will ask you to reboot to remove the files it found. Open MBAM (malwarebytes) and click on the Logs tab at the top. Is there a log that is dated for the time that you ran MBAM today? Should be the first one from the top. Last edited by DonnaB; 09-29-2012 at 09:02 PM. I guess it did not work. I selected the log and copied it and tried to paste it here. What do I need to do? I just looked at the logs and the one I did today is not there. There are several others that I did with different dates.....I guess I need to repeat so it is current. I did not understand how to do this and like I said, my computer was crashing every once in a while. but the logs were there in the Malwraebytes log section just as yu said except for the one I did today....not sure why that happened.